Registration is from 9.30am for a 10.00am start and the day will finish by 4.00pm. the course to benefit you. Both members and non- members of ACAT are cordially invited to this event. The cost is £35 to cover some of the outgoings. The Chatsworth Road Festival starts on Saturday 4th October with the Brampton Food Market at St Thomas' Centre 10am-1.30pm. 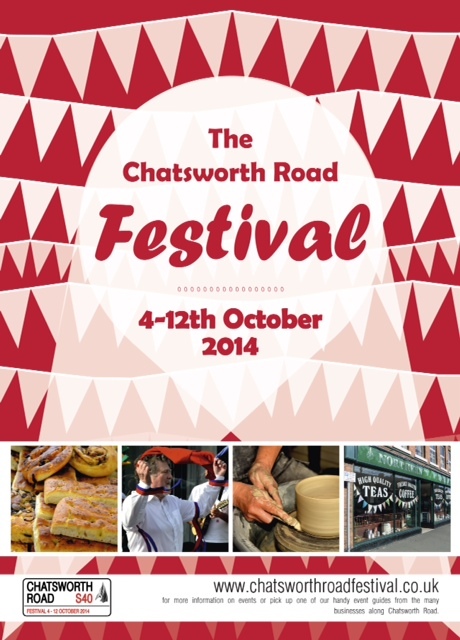 The festival continues until Sunday 12th October with lots of exciting events taking place up and down Chatsworth Road. If you haven't managed to pick up a guide check out the website www.chatsworthroadfestival.co.uk. Thank you for your ongoing support of local small businesses! Importantly, the Enabling Group of Christians Together for Chesterfield decided to postpone the FORUM announced for October 8th. It will now be on November 6th, and at the Ragged School at 7.30. 1 We are looking for a good ‘turn-out’ on Tuesday October 14th for our Chaplaincy Consultation which will happen in the Saints Coffee House adjacent to The Spire. Our guest, Canon Paul Morris of Worksplace Chaplaincy Derbyshire will speak. Several serving local chaplains will be there, but we need a good round-table discussion about chaplaincy development among us, whether with Fire and Rescue, the Market or The College or wherever. Please, be there, if you can, and make sure that your congregation is represented if you can’t be. 7.30, upstairs at the Saints. On October 8th my wife and I will now be on a coach returning from Glasgow, arriving only 8.25 pm, and the Enabling Group in its wisdom decided not to meet without me! As it happens, when we meet on November 6th, two significant ecumenical meetings scheduled for October 22nd will have taken place, and it will be possible to report on what they decide. More anon. With best wishes to you for all that is going on among us. Refreshments are available and everyone is welcome. Cost per lady is £12.50 which can be paid at the door but please contact Gail Slater 07859 050659 in advance to register and book your place.